I am wearing one of my favorite body-con style dresses from Gap. I love this dress because of the panelling of the horizontal grey and navy stripes which are extremely flattering. I also like this dress because it is a thicker cotton material, and a longer length which make it comfortable for dressing down for going out, or dressing up for work. Over top, I wore this motorcycle-style, burgundy, tweed jacket from Target. I love the color and material of this jacket for winter. 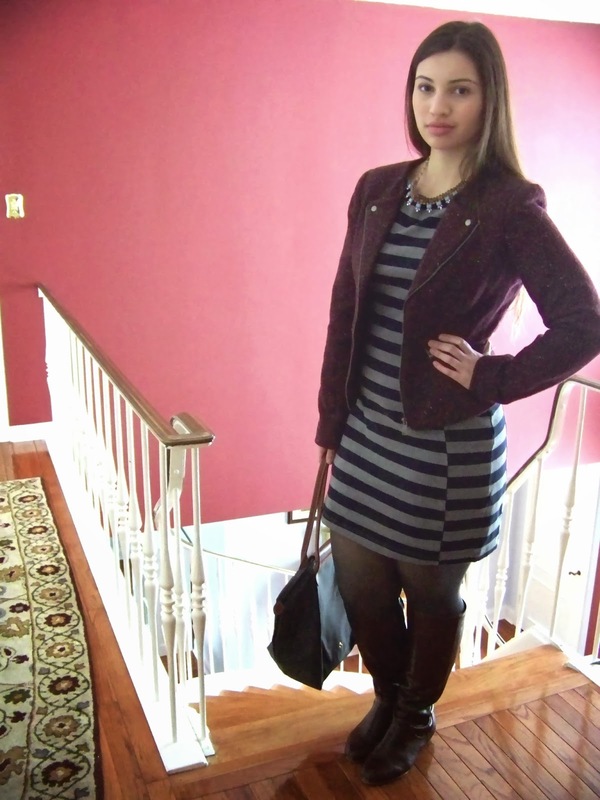 My necklace is a statement piece from JCrew which picks up both the navy and the burgundy colors in the outfit. Hope you all have a great day! What are some of your favorite winter pieces you are wearing?